From Monthly Review, Vol. 45, No. 6: November 1993. This is a most difficult time for revolutionary socialists. The rapid collapse and disintegration of the Soviet Union, the electoral defeat of the Sandinistas, the many problems of Cuba, and the demise of revolutionary Marxism-Leninism in Africa all force a serious questioning of basic ideas and strategies. It is a time when global capital seems to rule nearly unchallenged throughout the world. If revolutionary socialism is to be revitalized, received truths about revolution and socialism must be reviewed. Serious questions must be asked. Why so many failed revolutions ending in some form of elitist rule? So far most answers to this question wisely stress a global context of resurgent capitalism; however, it also is important to probe socialist revolutions internally. Amilcar Cabral was the revolutionary socialist leader of the national liberation movement that freed Guinea-Bissau from Portuguese colonialism. Although he was an important historical actor, here I am most interested in his development of a general theory of socialist revolution in the periphery. Born in 1924 in Portuguese Guinea, Amilcar Cabral was schooled on the island of Cape Verde and studied agronomy in Lisbon. In 1951 Cabral returned to Guinea as an agronomist for the colonial service and directed a nationwide agricultural survey. This work gave him an extensive and intensive knowledge of the socio-economic structure of colonialism in Guinea-Bissau. Around 1954 Cabral helped to organize a liberation movement which eventually became the PAIGC (African Party for Independence for Guinea and Cape Verde). PAIGC was small and its core members were petty-bourgeois civil servants and other salaried employees. Cabral's revolutionary strategy emphasized the political mobilization of the masses around practical material issues rather than grand theoretical ideals. Cabral tragically was assassinated as part of an attempted party coup designed by the Portuguese and internal dissidents. Eight months later, in 1962, independence came for Guinea-Bissau but sadly without Cabral himself. Cabral's theory of socialist revolution, true to the methodological materialism of Marxism, is based on a thorough understanding of the real socio-economic situation of the Third World. Cabral argues that the fundamental motive force of history is the development of the forces of production. Each mode of production, based in certain productive technologies, results in turn in a particular social class structure. Colonial economies and agricultural policies dramatically changed the internal situation of the colonies through the mechanization of production and the concentration of land ownership; that is, through altering the colony's mode of production from one based on hand tilling of small or communal plots to mechanized agriculture on large private holdings. Social classes became anchored in private ownership and technical knowledge. High-cost machinery and export production empower foreign capitalists, their technicians, and their local allies who gain control over the economic direction of the country. Colonialism also resulted in the denial of indigenous cultures and identities and the absorption of a European way of life. Imperialism, Cabral argues, is a structure of exploitation where the imperialist power controls the development of the forces of production in another society and thereby takes charge of its history. While he was aware that imperialism had in fact changed the operative forces of production in his country, Cabral also knew that the national proletariat was very small. He realized that the majority of the residents of what was to become Guinea-Bissau were peasants. The cities were characterized by the presence of a "declasse" element composed of a true lumpen proletariat and a group of new young migrants from the countryside. The country also had a small petty-bourgeoisie that could be subdivided into high officials and professionals and a second fraction of lesser officials and farmers. The former "higher" petty-bourgeoisie tended to adopt a pro-imperialist/colonialist politics but the "lower" petty-bourgeoisie may well participate in a struggle for national liberation due to its education and its direct experience of colonial discrimination and imperialist exploitation. There also might be a small comprador elite. This, of course, is a class structure common throughout much of the periphery of global capitalism. Regardless of the theoretical dogmatism of some, peripheral societies are largely made-up of peasants, marginalized quasi-urbanites, the petty-bourgeoisie, and a small national elite. Cabral recognized that peripheral societies are composed mostly of peasants and that it is this class that necessarily would be the largest physical force in any successful social revolution. Cabral posited that - in the age of monopoly capitalism - third-world movements against imperialism had become the central events of history. Real social change involved winning indigenous control over the forces of production while mere political independence would result in the continuation of imperialism as neocolonialism. Political independence is not the end of the liberation struggle but only a phase within it. History itself, after all, is determined by the development of the forces of production so a people can only reclaim its history by gaining control over their own productive technologies. Anything less is simply neocolonialism. Cabral's determination of the class structure of Guinea convinced him that, contrary to some applications of Marxism to the Third World, there was no single class agent capable of successful revolution. Cabral argues that the main social class contradiction in peripheral societies was between internal and external supporters of imperialism and the masses as a "nation class." The potential for revolution lies in the formation of an anti-imperialist alliance of various social classes including the peasantry and the petty-bourgeoisie. This "class nation" may in its totality only desire political independence, but it alone is capable of beginning the process that might end in a social revolution led by its more radical sections. Only after independence would there emerge a national bourgeoisie and other elites and the "lower social classes," including the lower petty-bourgeoisie and a group of associated intellectuals-like Cabral himself--who provided the theoretical leadership of the revolution. This latter group would be particularly important in a situation without a majority working class with revolutionary socialist aims. It should be clear that, excluding some Guinean particularities, Cabral described a social class structure common to much of the Third World. Socialist revolutions there must be built without a working class majority. This has been the situation of historical socialist revolutions from Russia to Nicaragua. Third World revolutionaries "must install a working class consciousness in a society without a working class." The majority of the population are peasants who make up the principle "physical" force of the revolution. They may be anti-imperialists but, without ideology and leadership, they are not likely to become socialist revolutionaries. This leadership can be provided by a revolutionary fraction of the petty-bourgeoisie, the class most likely to have had extensive direct contact with both imperialism and revolutionary socialist theory. Cabral felt that a key to the possibility of successful revolutionary socialism on the periphery lies in the post-independence role of the petty-bourgeoisie leadership of the nationalist movement. Will they be lured by the promises of neocolonialism into being satisfied with mere political independence? Will they merely use their political control to turn the state into a means of ruling class formation? If so, political independence will not bring true liberation defined as popular control of the forces of production. If the nationalist leadership simply acts on its own narrow class interest within the context of global capitalism, the petty-bourgeois class will preserve and reproduce itself as a privileged class, perhaps becoming a national pseudo-bourgeoisie. This is a strong temptation for the petty-bourgeoisie in that it allows them to retain positions and powers of leadership after a nationalist political victory. Social revolution, however, requires that the petty-bourgeois leadership of the independence movements commit a kind of "class suicide." Class suicide by the revolutionary petty-bourgeois leadership amounts to listening to its own revolutionary consciousness and the culture of revolution rather than acting on its immediate material interests as a social class. It must sacrifice its class position, privileges, and power through identification with the working masses. This unlikely event depends on the power and material basis of the revolutionary consciousness of sections of the petty bourgeoisie. The idea of class suicide by the revolutionary leadership is perhaps Cabral's most important message to socialist revolutionaries today. The absence of class suicide has blunted the progressive potential of many revolutions originally conducted under the banner of socialism. It is perhaps romantic to expect the leaders of revolutionary struggles to "wither away" and release power during the transition to socialism. It may never occur. But, it seems clear that if it does not happen socialist revolutions tend toward a more or less authoritarian statism--whether quasi-socialist or state capitalist--rather than true socialist democracy. The final power of capitalism as a global system lies in the politics of the conservative fraction of the nationalist petty-bourgeoisie that chooses to adapt to transnational capitalism because that route promotes its own class interests. The notion of "class suicide" by the petty-bourgeois leadership at first glance may sound unrealistic but it is much less so than the most popular competing images of socialist revolution in the Third World. Some suggest that "true" socialist revolutions must be the spontaneous outburst of the masses themselves. Often this seems to imply that these events will occur without formal political organization or a division of political roles between leadership and masses. The argument is that socialism must be radically democratic even when it is a nongovernmental revolutionary movement or even when it is involved in the long ardors of an armed struggle. This image of socialist revolution as spontaneous mass democracy is much more romantic than the idea of class suicide. No revolution can succeed without organization and leadership. To state that socialism can only come through a spontaneous mass movement without leaders and followers, without organization, without ideology and direction simply is to say socialism will not come. The second image of socialist revolution in the Third World is that it will occur as a result of a movement organized and led by an alliance of workers and peasants with an "organic leadership" drawn only from these classes. This image, though one I too am fond of, is too romantic to match with historical reality. The lesson of history seems to be that socialist revolutions in the periphery were led by Mao in China, Ho in Vietnam, Castro and Che in Cuba, Ortega in Nicaragua, MonDlane and Machel in Mozambique, and Mugabe in Zimbabwe. Marxist class analysis, of course, expects this to be the case when it discovers that peasant consciousness at best is radical only in the sense that peasants want to own the land possessed by large landowners and when it finds that the working class in the Third World is new, small, and - as a class-in-itself - not yet conscious of itself as a social class with a material interest in socialist transformations. Peasants and workers in the Third World will only become a force for socialism if they meet a political leadership that knows socialist theory and can present it to them. In most peripheral societies the class that has both the kind of educational experience that includes some knowledge of Marxism and the kind of personal experience that includes oppression at the hands of imperialism and colonialism is indeed the petty bourgeoisie. After all, socialism is a "scientific" theory and attitude which comes to few people without teaching, thought, and even debate. It is a fact that it is sections of the petty bourgeois that are most likely to be the leaders of socialist movements in the Third World. It is not romantic to think that socialism will come to the periphery via political organizations with petty-bourgeois leaders that must in the end commit a kind of "class suicide;" rather it is romantic to think otherwise. To be a realistic possibility, class suicide must be grounded in an equally material base such as radically new social institutions that protect the petty-bourgeoisie leadership from the temptations of power and lead it to give up its positions of privilege. This is, I believe, the final importance of the political mechanisms of direct democracy advocated by Marx and Engels (2) such as immediate recall, worker's salaries for political leaders, the rotation of tasks, popular courts, and a people's militia. It should be obvious that if leaders have some kind of permanency in office, are paid a luxurious salary, and claim special abilities they quickly will be removed. "Class suicide" will happen not by the power of will or consciousness alone. It will only happen if the material experiences of leaders are formed by institutional structures of radical socialist democracy. Militarist organization and "democratic centralism'' may well be necessary for armed struggle and other periods prior to the taking of power, but they must be rejected by the very design of "post-revolutionary" political institutions. Both liberation and socialism require bringing all hierarchies of privilege to an end, both those external to the revolutionary movement and those within it. It is better to have leaders and structures that anticipate and are prepared for a post-independence class struggle that includes the requirement of "class suicide" than to deny its reality through the romance of a spontaneously socialist majority working class. 1. For good studies of Cabral and his life, see Jock McCulloch, In The Twilight of Revolution (1983) or Ben Magubane, "Amilcar Cabral: Evolution of Revolutionary Thought" in Ufahama (1973). Cabral's own writing is well-represented in Revolution in Guinea (1969). 2. See the discussions in The Civil War in France and The Critique of the Gotha Programme. Thomas Meisenhelder is Professor of Sociology at California State University, San Bernardino. Great summary, I just wanted to rectify an error in you account. Cabral was assassinated January 20, 1973, and the country's independence was declared in Madina de Boé, Guinea-Bissau, 24 September 1973, with the Portuguese officially leaving the colony a year later, in 1974. Please see the quoted text from above, the date is wrong: "Cabral tragically was assassinated as part of an attempted party coup designed by the Portuguese and internal dissidents. 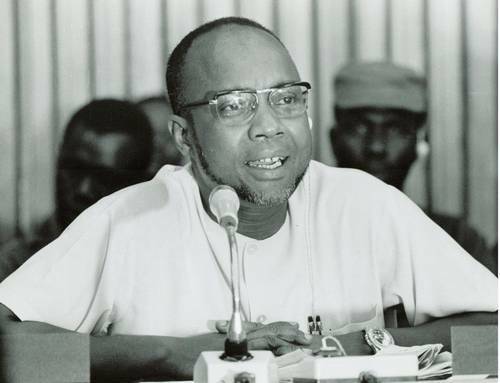 Eight months later, in 1962, independence came for Guinea-Bissau but sadly without Cabral himself." Anyone read Basil Davidson's book, The Liberation of Guiné: aspects of an African revolution? It's a really interesting account.